In September 2003 explorations began with the idea of establishing a support group in the UK for the Israeli Committee Against House Demolitions, based in Jerusalem, and founded by Dr Jeff Halper and Dr Meir Margalit in 1997. ICAHD was appreciated because it represented a unique voice of the Israeli “left” that not only worked on the issue of Israel’s demolition of Palestinian homes (a focus for activism) but which was also a “big picture” organisation that wanted to end the Occupation with a win/win solution for both Palestinians and Israelis, based on international law. It was felt that ICAHD’s familiarity with the realities on the ground gave it unmatched authority in its frequent contacts with diplomats, politicians, NGOs, the religious community and the international media. A bank account was opened in February 2004. Membership was offered for 6 years with a fee of £100. 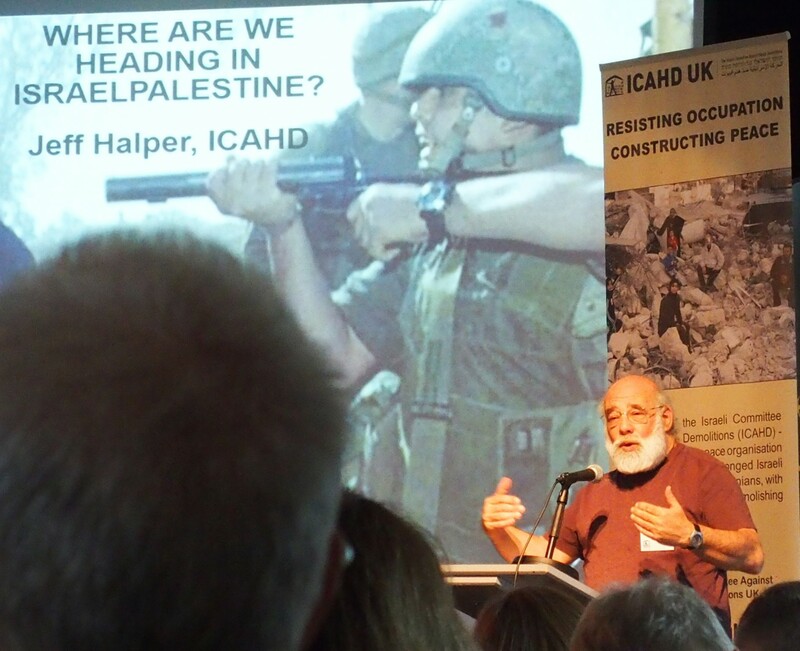 Soon there were 30 members which enabled ICAHD UK to to have enough money to plan an offical launch and Jeff Halper was brought to London for it to speak to politicians, academics and the general public. The first official event was a fund-raising evening held on 21st June 2004, at Southside House, Wimbledon. Speakers included William Dalrymple, Ghada Karmi and Jeff Halper. The formal launch of ICAHD UK was on 22 June 2004 in Portcullis House, Houses of Parliament, at a reception hosted by Crispin Blunt (Conservative), Richard Burden (Labour), Menzies Campbell (Lib Dems), and Ernie Ross (SNP). The event attracted 150 attendees composed of MPs, Peers, researchers, NGO representatives and ICAHD UK members. Following the events in London, Jeff proceeded to Leeds and Birmingham where he was hosted by our members for public meetings. By the end of 2004, ICAHD UK had attracted 80 members. It was given a small office in the premises of Medical Aid for Palestinians for a peppercorn rent. An ICAHD UK Chair was appointed and Rebecca D’Cunha (later to become Director of the Greenbelt Festival) volunteered a few hours a week to work as the administrator. Fund-raising for ICAHD was facilitated through “house parties” following a model that had been created in the US. Hosts invited friends over for a meal (often serving Palestinian food) that was followed by showing the 27-minute ICAHD film Resisting Demolitions on the Ground. It included footage of ICAHD resisting a demolition and later ICAHD rebuilding the Palestinian home. Jeff Halper is interviewed and ICAHD maps explained. A few years later, the demolition statistics in the film were updated by ICAHD USA and the length reduced to 23 minutes. At the end of the evening a collection was taken for ICAHD. The film proved more successful in raising funds in the States compared to in the UK nevertheless it was a valuable resource. Other funds for ICAHD were raised during UK speaking tours arranged for ICAHD staff which were scheduled an average of twice a year. Sometimes Jeff was invited to participate in events in the UK sponsored by other organisations, so his visits were more frequent. Disseminating information happened through the preparation of hardcopy leaflets, flyers, post cards and posters specifically for use in the UK. In the main these were about Israel’s demolition of Palestinian homes in violation of international law. Resources prepared by ICAHD – booklets, maps, photographic exhibitions and Obstacles to Peace: A Re-Framing of the Palestinian-Israeli Conflict, written by Jeff Halper with maps by Michael Youkan and PalMap were also used. ICAHD UK also had additional salable resources made such as mugs, greeting cards and mouse mats to help raise awareness. Newsletters were prepared for our members and a website was created. When Jeff Halper was in the UK, meetings were also arranged for him with journalists and this often resulted in mention of ICAHD in the mainstream media. Obstacles to Peace has been a core resource and has been updated several times over the years with the latest version printed in May 2018. The 2005 edition states that the publication grew out of tours of the Occupied Palestine Territory given by ICAHD for diplomats, journalists, study missions and activists. It presents a “grounded analysis” of the Occupation, the immediate source of conflict between Israelis and Palestinians. It describes Israel’s complex “Matrix of Control”; it examines the ideological underpinnings and military logic of Israeli expansion; it addresses the issue of terrorism and resistance; it asks what will happen if the Occupation becomes irreversible; it suggests the outlines of a just peace; and it offers practical steps to mounting effective international campaigns. A primary goal of this publication is to “reframe” in a way that balances Israel’s concerns over security with its accountability as the Occupying Power. The Occupation presents a profound challenge to all of us who aspire to a world based on international law and universal human rights. This publication is intended to empower you to act together with us. Israelis and Palestinians seeking a just peace. Lobbying has been an essential part of ICAHD UK’s work. It has been easy to gain access to members of Parliament and the Foreign Office because it represented a critical Israeli voice which parliamentarians, researchers, civil servants and diplomats were eager to hear. Until then most of the lobbyists were either Zionists or Palestinian voices. ICAHD UK sought to arrange meetings for other ICAHD staff in addition to Jeff Halper whenever they were in London so much lobbying happened during this period. ICAHD UK lobbied all political parties and, on several occasions, the All-Party Group on Palestine, chaired by Richard Burden MP, hosted the meetings. Presenting the bigger picture with the elements required for a just and sustainable solution was presented as much as possible. ICAHD rhetoric is not “pro-Palestinian” nor “pro-Israeli” but “pro-human rights” based on international law. In general, most other NGOs working on this issue are charities with a humanitarian focus. 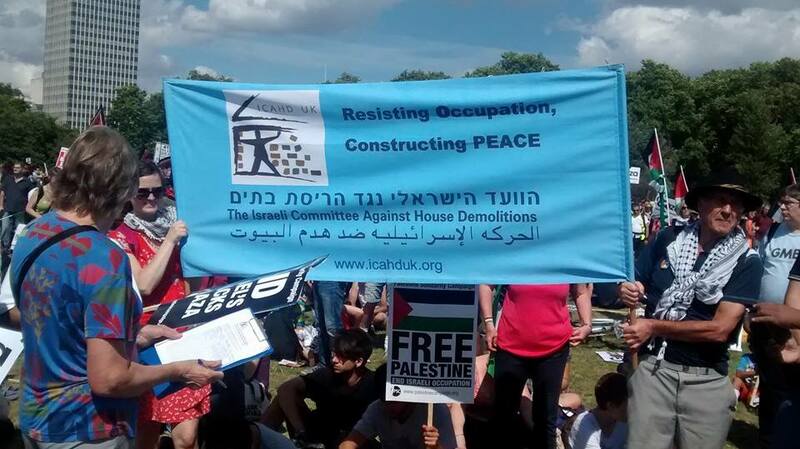 ICAHD UK has always wanted the freedom to be a political organisation with the ability to speak about ethnic cleansing, Israel’s growing apartheid policies over the Palestinian people, violations of international law, etc. 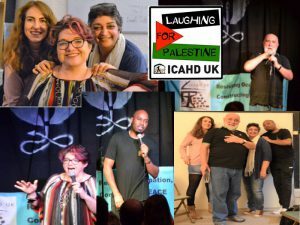 Most of the Palestine support groups do not mention the Israeli population therefore ICAHD UK brought an added dimension to the various meetings and events in which it participated. ICAHD UK’s core funding was obtained from membership subscriptions, donations from individuals, peace and justice organisations, Lush, a trade union, churches and other religious groups and the occasional grants. 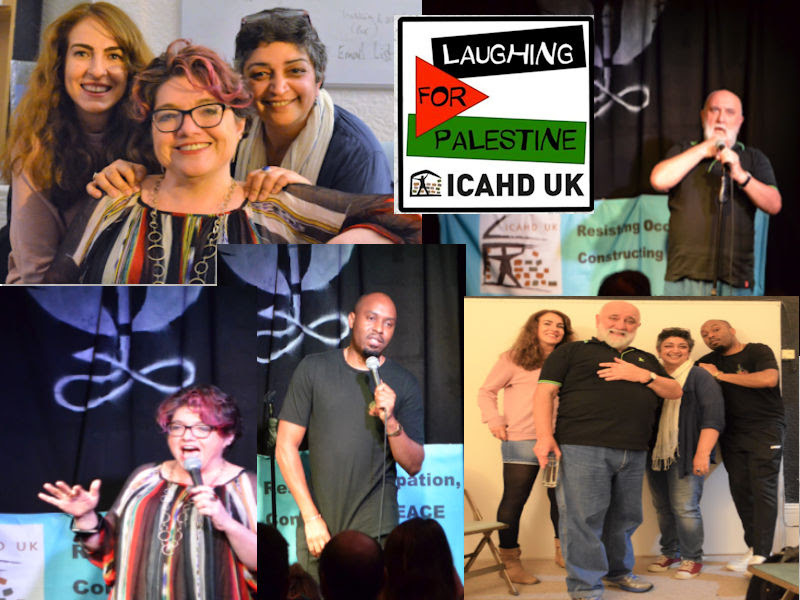 Comedians Ivor Dembina and Mark Thomas facilitated comedy events at the Edinburgh Fringe Festival to raise funds for ICAHD UK. ICAHD UK was registered as a Limited Company in January 2007. Over the years the following have served as ICAHD UK patrons: Prof Avi Shlaim, Prof Ilan Pappe, Prof Colin Green, Rt Hon Clare Short, Baroness Jenny Tonge, John Pilger, Rev Dr Stephen Sizer, Prof Marc Ellis, filmmaker Uri Fruchtmann and Rev Dr Michael Langrish. Since 2011, the Annual General Meeting, followed by the annual conference has taken place at Amnesty International Human Rights Centre, New Inn Yard, London. Venues before it included Somerstown Community Centre, Conway Hall, and All Hallows on the Wall. ICAHD UK’s Annual General Meetings have always attracted good representation of its members and numbers for the required quorum were exceeded. Between 2006 and 2017, speakers and workshop leaders have included: Janet Bloomfield, Malcolm Savidge, Rebecca D’Cunha, Frank Barat, Sarah Kosminsky, Dr Paul Robinson, Dr Stephen Leah, Prof Avi Shlaim, Baroness Jenny Tonge, Rt Hon Clare Short, Arthur Goodman, Prof David Pegg, Dr Monica Wusteman, Jean Lambert MEP, Prof Brian Klug, ‘Palestine Monologues’, introduced by scriptwriter, Sonja Linden and performed by Actors for Human Rights. Judah Passow, Prof Colin Green, Dr Mohammed Mukhaimar, Martine Miel, Mark Thomas, singer Mary HD, Yasmin Alibhai-Brown, Kate Allen, Ivor Dembina, Kristyan Benedict, Carole McKenzie, Miranda Pennell, Annie O’Gara, Hilary Tyrrell, Dr Martin Kemp, Terry Meade, Richard Barnes, Elizabeth Jadon, Prof Ilan Pappe, John McCarthy, Justin Butcher, Deborah Burton, Khalil Al-Amour, Salwa Karmi-Ayyoub, Tony Lerman, Nabila Espanioly, Heidi Swinyard, Carol-Ann Saul, Andy Bateman, Ahmad Masoud, Judy Granville, Dr Ardi Imseis, Robert Cohen, Ben Jamal, Judith Cravitz, Sara Apps, Omar Barghouti (on Skype), Atta Jaber (on film), Jeff Halper and ICAHD UK’s Founder. Contributors to the programme for the Members’ Dinner included the performance of Still Life (Penny Singer & Karen Chalk), Rev Dr Stephen Sizer, Prof Avi Shlaim, Baroness Jenny Tonge, Rt Hon Clare Short, Rev Dr Michael Langrish, former Bishop of Exeter, Tim & Mayonne Coldicott, Sue Ball, Nigel McCartney, Prof Colin Green, Sara Apps, Jeff Halper and ICAHD UK’s Founder. Until 2017, the Members’ Dinner was held at the Wesley Hotel, Euston Street, London. The first ICAHD UK website was a basic page of text with simple blurb about ICAHD UK activity and a few articles by Jeff Halper. 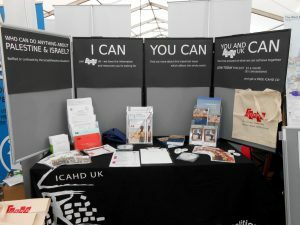 In 2005, volunteer Rob Thorburn worked with Fred Shlomka in Jerusalem to create an ICAHD UK website patterned after the extensive ICAHD website therefore it clearly illustrated that the UK was part of the ICAHD family. A completely different website and logo was prepared by Itay Epstein when he was co-Director of ICAHD and ICAHD UK followed suit. The current website was prepared by Daniel Roberts and his associates. For it the original ICAHD logo was streamlined to reflect that the UK is part of the ICAHD family. The identified colour scheme for ICAHD branding consisted of olive green, dark brown, light tan, brick red and sky blue. Over the years most of the ICAHD/ICAHD UK resources and the colours on the website and in newsletters reflected this colour scheme. Annually ICAHD UK arranged fund-raising events. Over the years sponsored walks proved popular and took place at different locations in England and in Wales with our members in the various regions assisting with facilitating them. Clare Short participated in one of the walks which helped to attract additional donations. David Rosenberg, teacher, educationalist and guide, led fund-raising walks through London with specialist themes which attracted new supporters. Beginning in 2004 and over many years, ICAHD UK was present at Greenbelt, a four-day festival held over August bank holiday weekend, both as an exhibitor and within the seminar programme which enabled ICAHD UK to reach many thousands of people with its analysis and resources. ICAHD UK had a stall at the European Social Forum held at Alexandra Palace in London in the autumn of 2004 and provided speakers for other conferences and meetings up and down the UK. It was part of the core team for Bethlehem Unwrapped, held at St James’ Piccadilly over the Christmas holiday period in 2013. 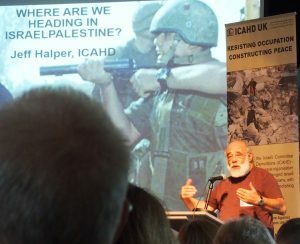 Jeff Halper participated in the programme and ICAHD UK was the only organisation to run a stall in the church for the entire festival. ICAHD UK kept a bank of speakers available to represent it at meetings large and small to raise awareness of the issue of demolitions and displacement both in the Occupied Palestine Territory and within the state of Israel and to share other ICAHD analysis. Since ICAHD UK’s founding in 2004, it has been part of networks and umbrella organisations. Significant ones have included Rediscovering Palestine (RP) – a network of 30 organisations where its Founder was on the executive committee and served as chair for four years. Others included the Interfaith Group for Morally Responsible Investment (IMRI), the Enough Coalition, the Boycott Israeli Network and more. 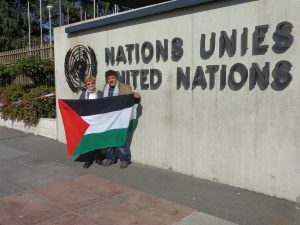 ICAHD UK has had a close relationship with Sabeel because for years Jeff Halper and Rev Naim Ateek, Sabeel’s Founder, shared platforms as they travelled together around the world, proving that as an Israeli and a Palestinian that they refused to be enemies. ICAHD UK’s Founder was invited to be part of the Kairos Britain Forum when Kairos Britain was founded in 2013 and advised on policy and lobbying. Over the years ICAHD UK facilitated joint meetings with organisations such as Jews for Justice for Palestinians, Independent Jewish Voices, Jewish Socialist Movement, Lawyers for Palestinian Human Rights, Amnesty and PSC. It collaborated with many organisations on the preparation and signing of statements, petitions and letters to editors and newspaper adverts and campaigns including War on Want and Campaign against the Arms Trade. More recently ICAHD UK worked on actions with Make Apartheid History. ICAHD UK is a member of the European Coordination of Committees and Associations for Palestine (ECCP). It meets two or three times a year in Brussels and engages in special lobby days at the EU. Obtaining grants for lobbying at the EU helped to increase our participation. ICAHD has rebuilt 189 homes and starting in 2003 began holding summer camps for internationals to allow them to stand alongside Israelis and Palestinians who refuse to be enemies in non-violently politically resisting the Occupation and Israeli government policy of demolishing Palestinian homes. In addition to rebuilding a fully-functioning home from the foundation to the roof ending in a dedication ceremony, the camps included a comprehensive educational programme with speakers, panel discussions and field trips. The camps were based at Beit Arabiya in Anata and hosted by Salim and Arabiya Shawamreh. The camps attracted visits from other NGOs, journalists, film-makers, and diplomats. Over the years ICAHD UK lobbied within British parliament, at the EU and the UN. Most years it assisted with Palestine Lobby Day, held at the end of November where ICAHD UK prepared briefing sheets specifically on the issue of demolition and displacement. Our team was brought in to brief MPs and their researchers and assisted in registering constituents preparing to see their MP. Our briefing papers were used on other occasions in British parliament as well as at the EU and UN where ICAHD UK facilitated speakers including Jeff Halper, other ICAHD staff from Jerusalem and ICAHD UK’s Founder. ICAHD UK prepared reports and ICAHD staff spoke at major events for the Human Rights Council and treaty bodies at the UN in Geneva as well as at fringe meetings. Major partners there have been Badil, Al-Haq, Adalah, and the Negev Coexistence Forum amongst others. ICAHD UK was part of Palestine Forum to coordinate joint actions with others on the subject of Palestine in parliament. Over the years, ICAHD UK participated in marches and demonstrations held in London to demonstrate support for justice and the observance of human rights for the Palestinian people. ICAHD UK’s banner and flags have been raised high. More than 60% of ICAHD UK’s membership is composed of people who have joined the political study tours to Palestine/Israel recommended by ICAHD and grounded in its analysis. The tours always spend time on both sides of the divide and have proved life-changing for the participants. Following the economic downturn that began in 2008, it became increasingly difficult for ICAHD to obtain large grants as less money was available. Obtaining grants became even more difficult because increasingly funders wanted to dictate humanitarian projects not ICAHD’s political cutting-edge campaigns. ICAHD closed as an official NGO in Jerusalem in 2015 as it could not meet the requirements demanded by the Charity Commission. Since then ICAHD has operated as a grassroots group and the main activities include providing ½ day political tours of Jerusalem (and further afield), briefings for politicians, diplomats, other NGOs, internationals, the media, etc, rebuilding and building. Jeff Halper also continues to write articles, books, provide media interviews, participate in documentaries and is in demand for international speaking tours. Chapters include ICAHD UK, ICAHD USA, ICAHD Finland and ICAHD Germany.